This book has won in the Purple Dragonfly Book Awards and in the Pacific Book Awards for 2018! IF was written and illustrated by a husband and wife team who have created this fantastical and lavishly illustrated story that can be read aloud to children. The story is meticulously and artistically illustrated with hand drawn and painted illustrations; it perfectly weaves the story and characters together in a memorable experience for young and old alike. There’s trouble in Cloud Kingdom. Planet Thera’s energy source, the Rainbow of Stars, is faltering. The stairways that connect the kingdom to the ground are falling apart. At the same time, the infamous Darkville town is becoming so popular that more and more people are moving there, even the good ones. Determined to solve the problems for the sake of the kingdom, Ifan Trulaugh－IF for short－embarks on a journey with his magical friends, Hatimiss and Stash. Along the way, they meet with the gallant but naive 14-year-old Chance, an enigmatic and beautiful girl named Whisper, as well as Bolt, the magical stallion. They are an unlikely band of heroes, but they are just what Thera needs. 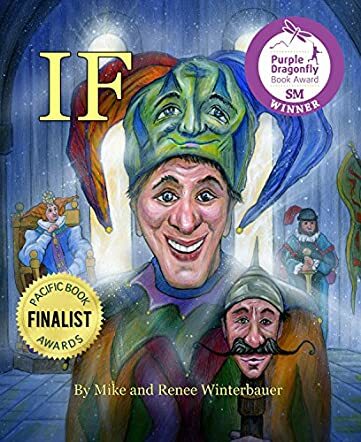 IF by Mike and Renee Winterbauer is eccentric, whimsical, and colorful in its storytelling, characters, and illustrations. It may seem that this visually attractive book caters only for children but it does not. The world building is delightfully fantastical, and the plot has all the elements of a fantasy adventure. The characters are diverse and unique, particularly Hatimiss the jester’s hat, and Stash the scepter with his magical mustache. That said, I have a soft spot for Whisper and Bolt. With its clear prose, this is a story that is created from ‘what ifs’ and taking chances. The pencil sketch illustrations are bold and vivid, and visually enhance the narrative’s tone and essence on every page. Even though I feel that the ending is a bit abrupt, this is a memorable work from Mike and Renee Winterbauer for children and adults alike. I look forward to reading the sequel.